Today is December 31st (rather late at that), and due to this it is time to look back at the first 4 and a bit-ish months I’ve been here in Japan so far, with that, here is the story of another AFS event held here in Nagano. On the 23rd October, the Nagano Nanshin branch, held a welcome party for the autumn students and the short-term international students, and a reporting party on returning to the temporary staff. I’m one of the autumn students. This event was held in Iina-shi, which is a very beautiful city as well. I like how these events are spread out between different places, my last blog being about an event in Ida-shi. The party came in 2 parts, the cooking party, and the speech event/reporting on past exchanges. Let’s talk about the cooking part first. The exchange students made food with their LPs, their host families and other volunteers. We made a lot of takoyaki and suchi rolls. AFS said on their blog post about this [It’s in Japanese], these cooking skills will help you impress your home family. 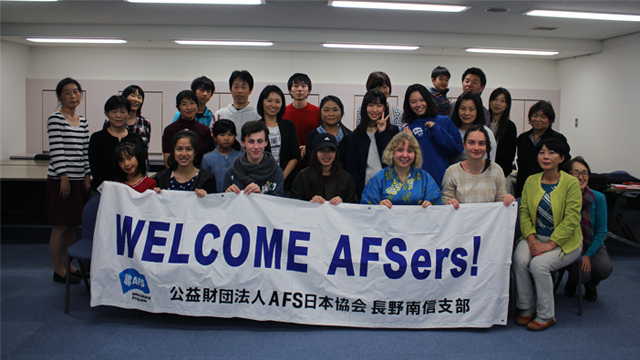 There is something I believe is really well thought out about AFS events, there is always a time to just talk about stuff with other AFSers, volunteers and host families. It usually is always centered about some fun activity as well, bowling, food, flying down a zip line upside down [spoilers, that’s a story for next year]. Yes I have my eyes closed, that’s the only photo I have. Here’s an interesting situation. See yourself sitting in a big room with tons of other exchange students and their host families and volunteers, and then being asked to give a speech. In the image above you can see people having powerpoints and books and everything, and that is because they were prepared to give an informative and interesting speech about their experience, in this case a person who was in Austria and in Spain. I did not know we had to give speeches, due to things lost in translation, so the screen behind me is black. The person next to me is from Finland, and she helped me translate because I may be able to give a impromptu speech about my stay so far, in October I was not able to give it in Japanese yet. She also made that Kimono herself, so let’s just take a moment to appreciate her skills. It’s really nice to hear other peoples stories and have them share their struggles and how they overcame them. The three exchange students that have been here for about half a year longer than us autumn students gave a Q&A, which is always helpful. It’s December 31st and it’s 10:35, so I think I’ll go down to my host family now to finish preparing for the New Years celebration. I hope you enjoyed this little story about an event long long ago. It’s always nice spending time thinking and reflecting on this time past.